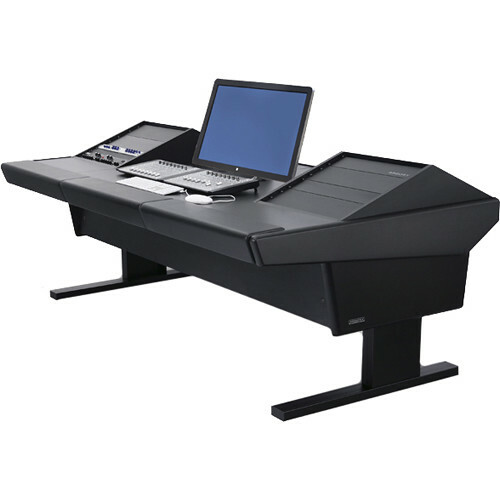 The black V2R Universal Workstation Desk from Argosy features two 10 upper rack module which offers a fully configured workstation console setup. This console system combines function, convenience, and style for your control. The chassis components are made of 19mm MDF to provide strength and durability with minimal acoustical influence. Open chassis design prevents thermal build-up and permits easy cable access. The enclosed utility area of the console separates, conceals, and protects gear & cabling. Desk inserts provide additional working space and flexibility to accommodate different configurations. Box Dimensions (LxWxH) 92.0 x 50.0 x 50.0"